MPG-o-Matic Toyota Tundra 4X4 CrewMax Review Summary: The 2008 Toyota Tundra 4X4 CrewMax goes toe-to-toe with Big 3’s full-size pickups, with plenty of power, a segment-topping towing capacity of 10,100 lbs., and a spacious interior with plenty of room for five. The Toyota Tundra competes with the Ford F-150, Dodge Ram, Chevy Silverado, GMC Sierra, and Nissan Titan in the highly competitive full-size pickup truck market. Under the hood, the short bed Tundra CrewMax is equipped with a 4.6 or 5.7-liter V8 engine. Our top-of-the-line 2008 CrewMax 4×4 Limited review unit was equipped with the 5.7-liter V8, which produces a generous 381 horsepower (HP) and 401 foot pounds of torque. The big V8 is mated to six-speed automatic transmission with sequential shift and tow/haul mode. The official mileage estimates for the 2008 Toyota Tundra 4X4 CrewMax 5.7L Limited are 13 city / 17 highway miles per gallon (MPG). We rolled up hundreds of miles on our Pyrite Mica review unit. By driving conscientiously with a light foot, we were able to exceed the official gas mileage estimates for the Toyota Tundra, with an average of 19.7 MPG on the Interstate highway and 16.8 MPG combined with no load. Test period temperatures ranged from the sixties through the seventies. Keep your foot out of it and the Tundra CrewMax Limited will hit its numbers. Dip into all that power a little too often and you’ll feel the pinch at the pump. Unlike the nearly all of the vehicles we’ve tested, the Tundra CrewMax 5.7L Limited’s Interstate highway testing showed little advantage between driving with and without cruise control. All 2009 4×4 5.7L V8 Tundras are Flex Fuel Vehicles (FFV) that can use E85, gasoline or a combination of both. We performed our tests with conventional unleaded regular gasoline. 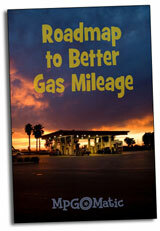 Fuel economy results while running E85 are likely to be significantly lower than with conventional gasoline. The CrewMax Limited includes a multi-information display with average and current MPG, range, average speed, and trip timer. Unfortunately, lesser Tundras may not provide this display, even as an option. The use of a current (a.k.a. : instant) fuel economy gauge is key to achieving better mileage. If you opt for anything other than the Tundra Limited, we’d recommend adding an aftermarket fuel economy display. The Tundra CrewMax is appropriately named and remarkably spacious, with 42.5 inches of leg room up front and 44.5 inches of leg room in the back seat. Big folks will appreciate all that room. While the interior is all about comfort, the cargo bed is all about convenience. Tailgate assist eases loading chores, while the deck rail system makes it a breeze to fit your tie downs. The optional bed liner makes it easy to slide cargo around and goes a long way to protecting the sheet metal. All-in-all, the Toyota Tundra CrewMax 5.7 Limited provides a whopping amount of power, towing capacity and interior space. If you have people to move, stuff to haul, and rough terrain to cover, this one just might be your ticket. ford has a 4.6, but toyota doesn’t, unless it’s really really new. other than that, great article. Thanks, Jason … great catch! The 2010 Tundra is available with a new 4.6 liter engine, updating the 4.7 that was available in previous years.